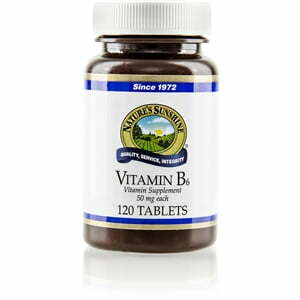 Nature’s Sunshine Vitamin B6 is composed of 50 mg of the B6 vitamin, or 2,500 percent of the daily value. Vitamin B6 stimulates the reactions of 100 different enzymes that perform tasks throughout the body. It assists in metabolization of protein, lipids, and nucleic acids. Individuals who consume large amounts of protein have an even greater need for vitamin B6. The vitamin may also support cardiovascular health, produce energy, and nourish the immune system. 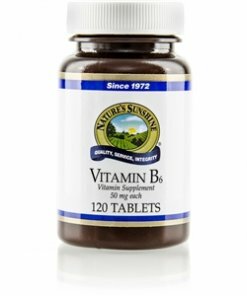 Nature’s Sunshine Vitamin B6 includes a base of wheat germ and does not contain animal byproducts. Cellulose (plant fiber), wheat germ flour, stearic acid (vegetable), and magnesium stearate (vegetable).